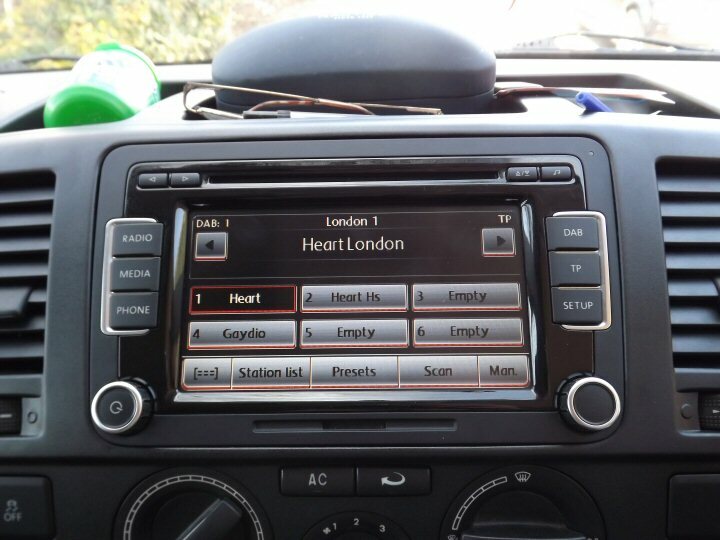 Product Description: The VW RNS-510 Headunit is a combined Radio, Sat-Nav and Media Interface with MP3 playback via an SD card slot. It is compatable with the latest MDI ipod kit(Optional), Genuine reverse camera(optional) and Genuine bluetooth phone kit(optional). Only genuine VW parts are used in the installation of this product. The work done can be done on a call out basis however this may be subject to a call out fee. *Please note: Vw T5 Van requires a 1.6>2.0 CANBUS adaptor, this is included in the price below. 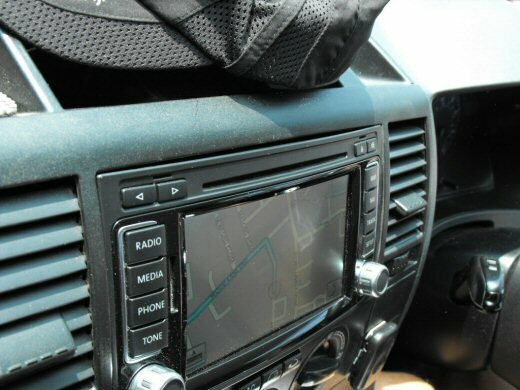 Unfortunately models that require CAN adaptor will not display Sat Nav info in the Driver Information System. This applies to all T5's. Models with CAN adaptor cannot be changed to Mph in map mode. Only limited functions of the MFSW will operate such as volume control, next/previous track and telephone functions (if fitted). 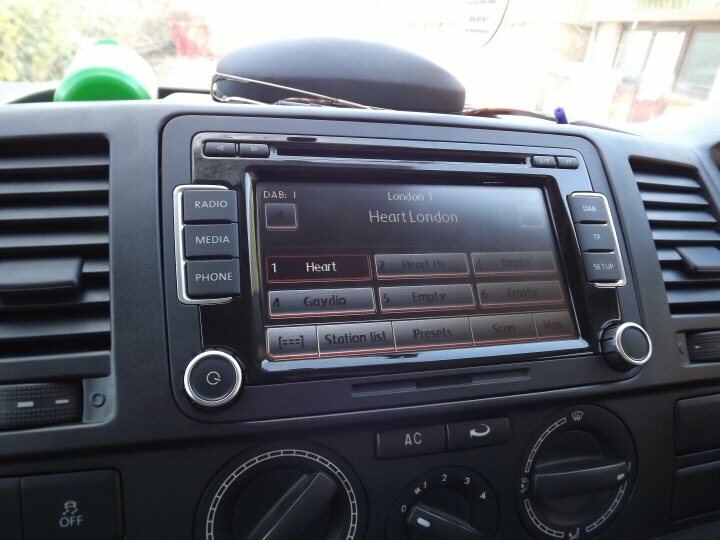 You will have the radio station name displayed in the Highline Red DIS (if fitted). Please note: The T5 van requires us to trim the existing facia to allow the square 7L6 unit to fit, this is included in the installation price, this looks neat but will leave a 2-3mm gap at the top, please see pics below. Alternatively we can offer the T5.1 centre console upgrade, this allows for the RNS-510, RCD-510 Navigation to fit very well, see pictures below, if you require this option please select the T5 Trim upgrade below (not suitable for models with heated seats). Note: The T5 can be fitted with a rear view camera but will require manual selection on the RNS-510 by uising the media button, this can be used in reverse and when driving normally. (no auto switch when in reverse). 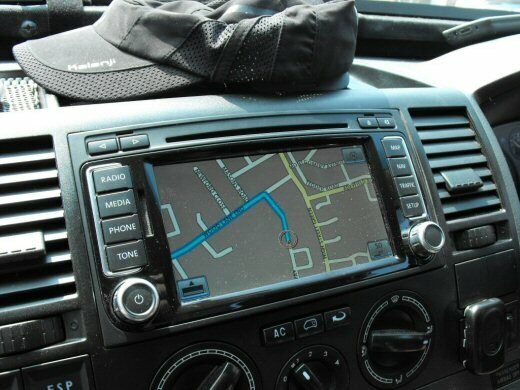 All units we supply are the very latest and come with latest firmware and maps installed. Latest maps include full postcode search for UK and Western Europe. Installation usually takes 3-4 hours. Optional extras such as Bluetooth, MDI or camera will take longer to install. Above: 7L6 RNS-510 fitted to T5 van with centre console trimmed. Above: 7L6 RNS-510 fitted to T5 (2004-2010) Note: small 2-3mm gap at the top. Above: T5 2008 with T5.1 centre console upgrade. Above: T5.1 centre console upgrade, please select this option below if required. Please note: this option is not suitable for models with heated seats. Add Bluetooth? No thanks I do not require Bluetooth. Yes please add Genuine Bluetooth to my order. Add T5.1 Trim Upgrade? No thanks I do not require the T5.1 trim upgrade. Yes please add the T5.1 trim upgrade to my order. New or Refurbished RNS-510? I would like a new unit please. I would like a refurbished unit please.